A small movie of 2mn15 about my engraver’s job medalmaker, thank you Pierrick Servais. The Royal Saltworks presents a festival of the gardens the theme of which is renewed every year. Several gardens in the infinite variations of forms and colors surround the buildings which make from now on of this festival one of the most famous of Europe. This good name comes from a cooperation carried all year round in connection with about fifteen schools which make gardens a work shared with all the pupils and their teachers. All the formations of the high school Ferdinand Fillod driven by Aurélie Masselin, professor bronze-smelter of art, gets involved for 7 years now with passion and enthuses. The Prefect of the region Auvergne Rhône-Alpes, Michel Delpuech puts hands the medal of the National order of the Merit to Nicolas Salagnac, 3 Mars 2016, in the prefecture of the Rhône, surrounded with his family, with MOF, with friends, and with collaborators… Thank you. Video of my brother Pierre Salagnac, thank you. Two stamps gaufrés for the French Southern and Antarctic Lands, for 60 years of Fillods. 60 years ago, Ferdinand FILLOD creates and installs metallic constructions (famous « Fillods ») on the islands of the French Southern and Antarctic Lands to shelter scientific expeditions. Nicolas SALAGNAC, engraver medalmaker – MOF, in Lyon saw entrusting the engraving of two matrices on this subject by FRENCH SOUTHERN AND ANTARCTIC TERRITORIES, to print by post of Périgueux, complete stamps in embossing. Thanks to Pierre ALBUISSON and Elsa CATELIN, engravers of stamp, for their advice and supports. And thanks to Marc BOUKEBZA, his team of FRENCH SOUTHERN AND ANTARCTIC TERRITORIES and in the post office for the trust which they carried me for this original work. Portrait and Nicolas SALAGNAC’s discovery, engraver medalmaker, Best Worker of France, creator of medal in its account in Lyon. A movie writes, realized and gone up by Susanne SCHUBERT in 2011. This movie is realized within the framework of the workshop of realization of the 5th year of university preparing to work for a company « Distribution of Arts and the Knowledges by the Image » of the University Light Lyon 2. Under the look of Remi FONTANEL and Laurent Charles, at the request of CAP CHANNEL and under the coordination of Nathalie BERGUERAND, director of CAP CHANNEL – on 2011. The quality of this movie is average, because it comes from a old recording on VHS… But for lack of having better, I show it to you as is. Leather Goods in Franche Comté: leather, metal and imagination! Film of the Regional Development Agency Franche-Comté: Leather Goods in Franche Comté: leather, metal and imagination! Businesses, and training involved in this luxury sector, the LP Ferdinand Fillod with its goldsmith workshops in crafts: Bronze Frame / Chasing and engraving modeled: 9 minutes on a film 14 minutes. Little film from a first in France, for the 22nd Student Medal Project. The medals of the competition: 10 French creations from the « Jura », were judged in the British Museum with 95 British creations. The French sculptors creations just 6 students (2nd year CAP) of the LP Pierre Vernotte from Moirans en Montagne and 4 students engravers (2nd year CAP) LP Ferdinand Fillod Saint-Amour. Thank you to Christine Joly and Pascal Doussot from Lp Pierre Vernotte, and high school Hector Guimard Lyon for foundry work. I was asked to engrave a medal for a video clip about the 2012 Ironman triathlon race. Direct carving from a bronze piece. A few hours of shooting late into the night with a great team. The idea was interesting: drawing a parallel with the athletes putting out intense physical efforts and myself working hard on the medal one of them was about to win, even though my own efforts weren’t exactly comparable. I was pleased to get involved in this film which has been very successful and even won an award in the Sportel of Monaco. Directed by Julien Bertin and produced by Dan Miodownik (HBS Production). 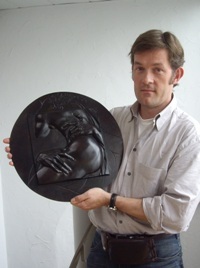 This film describes the creation stages of the making of a medal inspired by a detail in a sculpture from Le Bernin, « The Abduction of Proserpine by Pluto ». The work started at the Nicolas Salagnac Workshop and was continued at Pichard-Balme, the striker. I feel very grateful for the Pichard-Balme workshops to take us behind the scenes – that is, the stages of the striking of a medal. And thank you so much, Fabien, for your involvement in my works and my craft. Interview of Nicolas Salagnac, engraver and medal maker, Meilleur Ouvrier de France, during the annual reception of the Opus in Fide network at the Automobile Club de France’s, on June 6th, 2011. After my 35 hours in the evening, at night sometimes, some many weekends and during certain holidays, I filmed for three years on my steps for the MOF competition, subject to imposed after Vigee-Lebrun drawing. For more information, see the article on my spare MOF competition : link. Reportage Emilia Joulia Canal Academy. The art of the coin, Academician Paul Belmondo. Meeting with writer medalist Nicolas Salagnac, Meilleur Ouvrier de France, passionate about his job, a job that once deserved all respects and even a chair at the Academy of Fine Arts. Our guest, addressing the art pays tribute to Oscar Roty and Paul Belmondo, the Academy of Fine Arts, who executed the medal many academicians. « Étincelles ». A film about the training of arts metal, LP Fillod Ferdinand de Saint-Amour – Jura, Alexandra Santander and Didier Boyat of: Sueño in the Fábrica. Grand Jury Special Mention 2013 9th festival of education Evreux film organized by the CEMEA. It is vocational school of metal Fillod Ferdinand de Saint-Amour Arts – Jura, Alexandra Santander and Didier Boyat of: Sueño in the Fábrica residency artist, come to meet teachers and students. The first present workshops and various training and the second evoke enthusiasm discovery trades metal and commitment to artistic creation it allows. Sueño in the Fábrica is an original sound concept of strong identity experienced in brownfields and developed on stage with many artists and musicians, but also with scientists. His shows are presented in many countries every year with original music and many multimedia entertainment between Art and Science. The site Sueño in the Fábrica : Link. See the website of Ferdinand LP Fillod, metal arts, Saint-Amour – Jura: Link. « Le Potager Kokopelli », Royal Saline of Arc et Senans. A film about the art of metal arts high school Ferdinand Fillod Saint Amour business training – Jura. A film by Alexandra Santander and Didier Boyat of : Sueño in the Fábrica . As part of the 13th Festival of Gardens of the Royal Arc et Senans our students involved in the » garden of Kokopelli » . This project is for the fourth time (in 2012/2013 ), led by Aurélie Masselin professor Chasing and Frame in Bronze LP Fillod in collaboration with Patrick Percier , head of Gardens of Saline. For two days in May 2013 , our students participate in this installation. Warm and friendly time , our students and their teachers happy working together . Thank you to Alexandra and Didier Sueño in the Fábrica , writer / director of this film that allow its distribution here . A Sachedina Clement , a former student of mine for music. See their website Sueño in the Fábrica : Link. See the website of Ferdinand LP Fillod , metal arts , Saint -Amour – Jura : Link. Finally, a thought for Patrick Percier responsible Gardens of the Royal Saltworks , left too early to reach the stars (last Sunday February 23, 2014 ) , always available, green thumbs , inexhaustible on the plant world and nature. We miss you already . From 7 to 9 March 2014 in Montpellier Corum. 2014 marks a turning point in the history of the festival because for the first time extends its field of expression for all crafts. In fact, created in 1998 by Art Workshops France, under the leadership of Loulé Combres ceramist, he celebrated the clay and glass images. The objective of this unique festival is to help develop the creation and distribution of films from around the world. It stimulates and cultural exchanges and educates the public to the private world, sometimes mysterious crafts. Now renamed International Film Festival Crafts, it honors all the meaning of diversity.